Following on from the LRS Internal updater server blog post i wanted to give me details in what i found when trying to use WSUS with LRS’s. It appears although WSUS is allowed to be configured in the LRS and SMARTs documentation and Microsoft KB mentions using WSUS but it seems the LRS wont use WSUS even if you configure it to!!! If you allow your LRS internet access either directly or through a proxy server the LRS will download and install its updates from Microsoft Update server and from an OEMs update Server so job done. This relies on the LRS being allowed to access and be able to download its updates. In some scenarios and customer environments this is not allowed so you need to setup an internal update server to provide updates for the LRSs without internet access. But what about WSUS Server for my Microsoft Updates ! BUT what about the Microsoft Updates and the option to use an internal WSUS for the Microsoft Updates!!!! Your first thoughts are ok i need to point the LRS to a WSUS Server to get the Microsoft Updates for Windows 7 embedded as documentation mentions this can be used. I found that if you configure the LRS to point to the WSUS Server http:\\wsusserver:8530 the LRS never reports into WSUS even after a restart. I tested the LRS connection to WSUS via cmd and internet explorer and it worked ok.
and found that although WSUS was configured and enabled the registry key values were in fact set to NOT use a WSUS server! I did mange to modify the registry and get the LRS to report into WSUS but i wont mentions what i did as if you read on you shouldnt use WSUS it seems. This made me think perhaps this is by design, i decided to look into the update package downloaded from SMART to see if any Microsoft OS updates are included in there and yes they are. 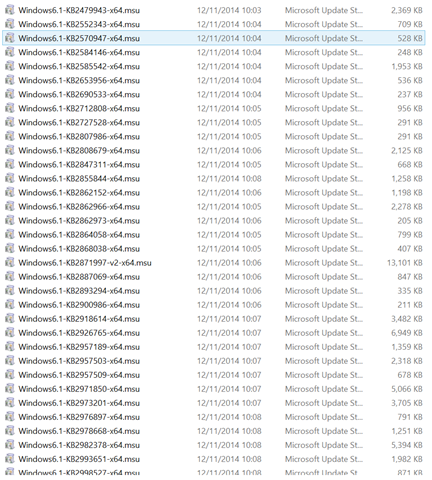 particularly update 15.12.1 where they 34 updates. 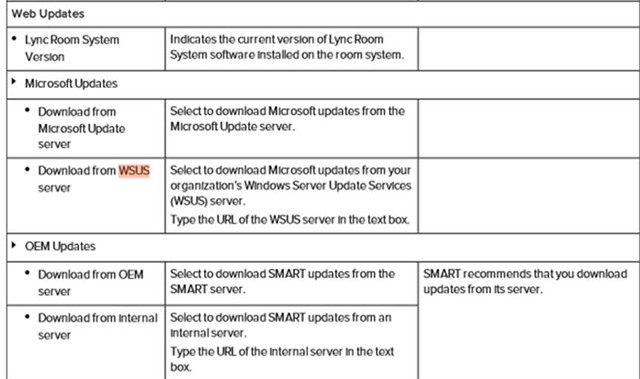 I checked the SMART documentation again and its mentioned you can configure WSUS and to check i wasnt going crazy. and the Microsoft CU KB mentions WSUS under Intranet Server Updates as well. When you think also as the LRS is an appliance how do you know what Microsoft Updates approved and are supported for the LRS to not break it ????? I reached out to SMART and im waiting for updated documentation on this as i found it very confusing and spent ages on this for something that appears not be needed / should be used. SO my understanding now is that when you use an internal Update Server to apply the OEM update this ALSO applies the Microsoft updates! and you should not configure the LRS to use WSUS. What id like to see now is updated documentation from SMART and Microsoft to confirm this. Perhaps WSUS has been left in the LRS settings for the future maybe but for not its confusing !